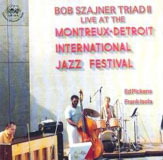 Bob Szajner was born on September 12, 1938, he grew up listening to talented relatives playing various instruments. His mother taught him the basics of music and how to play piano at a very early age. In 1948, he won first prize in the Frankie Carle Piano Contest. This entitled him to one weeks performance at the Fox Theater in Detroit. He was one of the opening acts on the bill (a vaudeville theme) for Billie Holiday along with a comedian and an acrobatic duo. He enjoyed listening to her (Billie Holidays) style of music and accompaniment for her. This was the beginning of his quest for his own personal style. Ten years later, for at least ten years, he started writing and performing Modern Jazz later known as Bebop and then later as Hard Bop. He performed with many musicians from the Detroit Jazz scene at various sessions, venues and jazz clubs throughout the Detroit Metropolitan Area. He often worked with Donald Byrd, Charlie McPherson, Lonnie Hillyer, Roy Brooks, Yuseff Lateef, Pepper Adams, Frank Isola and others as a back-up piano player. For the next ten years, he wrote some tunes, but really became quite dismayed and disappointed with the business of music, especially, the lack of audience. (featuring Frank Isola on drums and Ed Pickens on bass). A new album endeavor on the bench_in the zone recorded at the Jazz Cafe/Detroit Music Hall on October 8, 2008 featuring Bob Szajner on piano, Ed Pickens on bass, and Allan Colding on drums (The Bob Szajner Triad Iv) has just been released on the RMS008 label. ...without retakes...inspirational...to conceptualize the challenge and integrity involved in subscribing to the strict ground rules....... Dr. Herb Wong / KJAZ Almeda,California U.S.A.
All About Jazz musician pages are maintained by musicians, publicists and trusted members like you. Interested? Tell us why you would like to improve the The Bob Szajner TRIAD II musician page.